Must read post: Are TB Joshua’s miracles real? Nigerian blogger Peter Adeosun has just published an excellent article examining one famous “healing video” put out by Emmanuel TV “Walking Dead Returned to Life”, a video we never got round to watching until now. Adeosun points out that the video is actually a composite of 3 videos, video 1 is inside video 2 which is in turn inside video 3. It’s a video of the full congregation in the church auditorium watching another video on a big screen. The video they’re watching is the recording of a miracle healing session that took place sometime ago. And in the video they’re watching, TB Joshua is talking to a very small group of people (40? 50?) in another venue, a smaller room. The people probably came for healing too. And he himself is talking to this small group of people, running commentaries on the healing of a man afflicted with a skin disease, the healing he did sometime ago. This kind of complexity makes it difficult to follow along and piece together the timeline, in other words, you are totally at the mercy of their narrative, and it is a perfect way to bury what might otherwise be obvious deception. What honest reason could they have for telling the story in such a convoluted way? If that’s not suspicious enough, Adeosun goes on to allege (with good evidence) that the man before and after is not in fact the same man. In his article he shows a side by side comparison of the before man’s face and side of head with the after man’s face and side of head, comparing some of the facial features. It is indeed very hard to believe it is the same person. Click the link to go to Adeosun’s site and let us know what you think? These are the kind of videos that help feed the myth of TB Joshua, slowly people are coming to realise that, much like his edited prophecy videos, there are a lot of tricks at play in these healing videos. Follow the links below for more information. Here’s one celebrity visit to SCOAN you won’t be hearing about on official SCOAN channels. Martin Tumenta Chou, Major General and Commander of the United Nations Multi-Dimensional Integrated Stabilization Unit in the Central African Republic (MINUSCA) has died at the age of 61. It has been widely reported that he passed away at SCOAN while seeking healing. There’s not much more we know about the situation, but you can read more in the links that follow. We’re not commenting at all on the rumours that he was killed, the links below are just evidence that his death happened at SCOAN. Our sympathies go out to his friends and family. We’ve also told the story of Anna who died after being “healed” of breast cancer, and ex-disciple Giles lost his mother again after “healing” by TB Joshua. Even TB Joshua’s (former) evangelist John Zavlaris lost his wife after she was prayed for by TB Joshua. All of the cases listed above are in addition to the 3 deaths reported by the BBC and Sky News. Others such as Judith and Beth would have died if it wasn’t for last minute intervention by medical professionals. If you are considering visiting SCOAN for healing, we strongly advise you to not waste your life and your money. A couple of years ago you may have read the exciting news that a 2.5 year old girl has been cured of HIV. What caught our attention when following the story was the fact that this girl is reported to be the second person in history to have been cured of HIV. Here is how some of the big news agencies are reporting it. What about all those supposedly healed of HIV at SCOAN? On their website currently they have multiple testimony videos of people claiming they were cured of HIV at SCOAN. 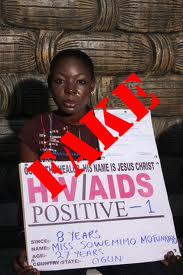 Multiple identical news articles (usually proof that it is the work of SCOAN PR rather than genuine a journalistic piece) on African news sites state that “HUNDREDS of people from across Africa have said they were healed of HIV/AIDS after visiting Nigerian Prophet TB Joshua” (e.g. here and here). One of our regular commenters “General” has compiled an invaluable resource on Youtube about TB Joshua. As we said in our introduction to Anel’s story, many people on first exposure to SCOAN are both impressed and disturbed. The sensible thing to do would be to follow your concerns and see if there is any substance to them. That’s one reason “TB Joshua Watch” exists, and this video resource also gives a very thorough and in depth look into the ministry of TB Joshua. If you want to have a deeper understanding of the concerns we have about SCOAN, this is a great place to go. There are 8 videos of varied length, you can pick any of them to watch below – we particularly recommend “TB Joshua a false messiah“. Thanks General for this valuable resource! Back in 2001 South African Journalist Jacques Pauw did a documentary on TB Joshua. We have featured quotes from Pauw in several articles, but until recently the full documentary was not available to watch online. The documentary particularly focuses on the fake resurrection video that SCOAN were widely circulating a number of years ago, but it also reveals a number of people who have died after being “healed” by TB Joshua. To this day, we have no evidence, verified by third party medical professionals of any genuine healings taking place at SCOAN. 2014 was a year of spectacularly wrong prophecies from TB Joshua and a terrible tragedy that claimed the lives of 116 people and permanently injured many more. It was a year when TB Joshua’s credibility as a prophet and healer was severely undermined (how did he fail to see the SCOAN disaster? Why were the victims not healed/raised from the dead? ), and SCOAN attendance plummeted, even to the extent of having an impact on national tourism revenues. It was a year he was caught bribing journalists, and was threatened with arrest for continuously refusing to turn up to court. It is our prayer that the events of 2014 will help open the eyes of those held captive by this cult so that in 2015 they may find their freedom, and the abuse and deception will end. Below we present TB Joshua’s 3 most obvious prophetic failures, but we present this with sadness. In all three cases we wish he had been right, we wish MH370 was found, the Chibok girls were released and Ebola was written off, but sadly the words spoken were not God’s, they were just a deceitful, callous man trying to please his audience.